Since 1991 I’ve been making collages in my studio in Northport, Michigan, inspired by the playfulness and flexibility of collage. A typical image for me is an expressive bear shape cut from red silk, pre-painted with a red brushstroke, and adhered to a painted silk beach and sky. I love combining painting and fiber traditions, joyfully telling my own story about living in Northern Michigan in colors and shapes translated through my imagination, eyes, and hands into an offering I can share with others. Painted silk collage in shadowboxes. SmithKline Corporate Headquarters, Philadelphia, Penn. Sealed Power Corporate Headquarters, Muskegon, Mich.
Char has maintained a studio in Northport, Mich., since 1991 where she owned Zoon Gallery 1992 to 2002. 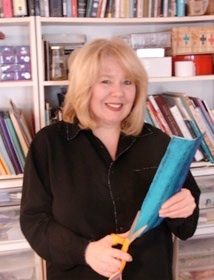 She has taught at Wayne State University, Lansing Community College, The Center for Creative Studies in Detroit, Northport Public School, Suttons Bay Public Schools, and the Ann Arbor Art Association. Char’s work is included in many private and corporate collections, and she has exhibited in dozens of galleries nationwide. She lives Northport with her husband Steve Wetherbee and son Ben, a University of Michigan student. They sail to Beaver Island every summer and enjoy nature in Leelanau County.